Okay, maybe not your ENTIRE life, but certainly your kitchen life! And since we all spend so much time in the kitchen, it’s pretty much the same thing, right? 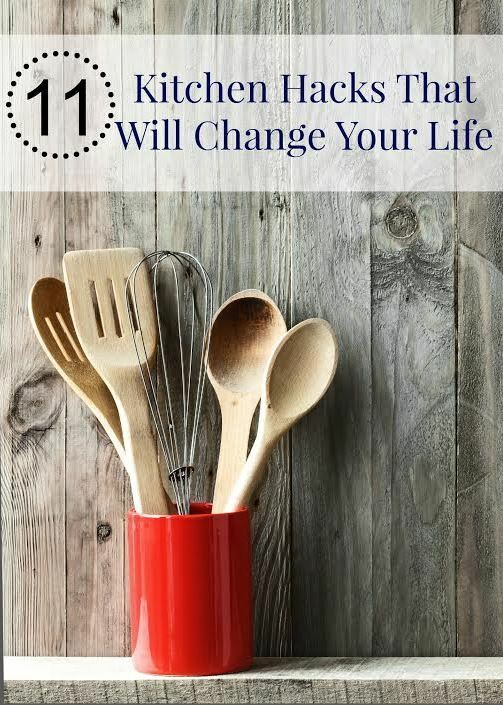 Here are 11 of my favorite, often used hacks that make kitchen life much easier. Freeze meat – It is cheaper to buy larger cuts of meat and slice it yourself. To make slicing super easy when you bring it home, pop your meat into the freezer for 30 minutes and it will slice like a dream! You’ll want to make sure to use a quality kitchen knife to make things even easier. Shred chicken – Shred it easily and effortlessly just by using your stand mixer. Didn’t know you could do this? It is an amazing time saver! Just pop your hot, cooked chicken breasts into the bowl of your stand mixer and beat on medium high until shredded. This can be used immediately or cooled and bagged in the freezer, ready for future recipes. Use your coffee grinder – In addition to using your coffee grinder for coffee beans, use it to grind your own spice blends, turn oatmeal into flour, make bread crumbs from dry stale bread, and small amounts of powdered sugar (granulated sugar and cornstarch). Skim fat – off soups, stews and other similar dishes by dropping ice cubes into the pan. Don’t leave them long (you don’t want them to melt into your dish), but when you scoop the cubes up with a spoon, you’ll find that the fat has congealed around them. If you want to risk only minimal melting, put your ice cube on a slotted spoon and gently run it across the top portion of your dish. This will allow you to better control how long your cubes are exposed to the heat. Cook bacon in your oven – If you have not yet learned this kitchen hack, you are missing out! No grease spatter on your stove, no smoke through the house, and evenly cooked, perfect bacon every time. Place bacon on an aluminum lined baking sheet and insert it into the cold oven. Turn your oven to 400 degrees and bake for 20 minutes. The bonus? Your house will smell wonderful. Keep cookies soft – and fresh by placing a slice of bread inside your cookie jar, on top of the cookies. The cookies will absorb the moisture from the bread and stay soft. You’ll want about a quarter piece of bread (white bread is best) per dozen cookies. Change it out ever few days. Freeze fresh herbs – in olive oil in ice cube trays to make adding them to recipes super easy. Add 1 Tbsp of olive oil to each cube, add in your favorite chopped fresh herbs and set them in the freezer for future use. Set a wooden spoon – across your pot when boiling liquid. It will stop the liquid from boiling over onto your stove top. Keep an eye on the wooden spoon because while it does work most of the time, once it becomes extremely wet from the evaporation, it will lose the magic effect. Microwave vinegar – to steam clean it. Place a shallow dish of half vinegar and half water in your microwave and heat for 1-2 minutes until it begins to boil. (Be SURE not to walk away during this period, as you will need to stop the microwave when you see it boil.) Do not open the microwave – just leave the bowl until it has completely cooled. Open your microwave and the steam created by the vinegar not only sanitizes, but has loosened all the stuck on spots. Grab a sponge and wipe it all away! Get more juice – out of your lemons, limes, and oranges by microwaving them 20 seconds before juicing. Ready for more tips and tricks? Read more Couponing Tips here and Articles here.